An arts organisation running a theatre and arts programmes in the poverty-stricken township of Delft, say they are being evicted by the City, to the dismay of residents. 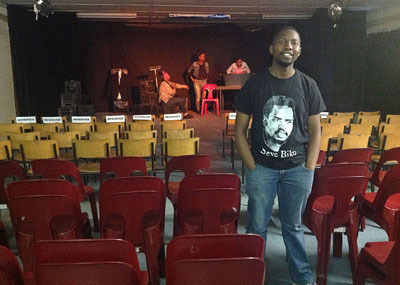 Established in 2006, the Rainbow Arts Organisation (RAO) have been operating a theatre and arts space from the Delft Rent Offices since January 2012, and has developed talent among local residents. But RAO co-founder Mholi Ngabanjani says on in the first week of October, the City gave them 21 days to vacate the premises. Their plight features on online petitioning site Avaaz.org, gathering over 300 signatures so far. “We are not going anywhere. The programs we are running are changing the lives of young people,” he said. These include programmes in poetry, dancing, computer literacy and business management. They had also spent R100 000 of funding received from the National Lottery to convert the premises into a the Black Box theatre where plays, hip hop performances, workshops and community events take place and a number of original plays by local writers have premiered there. Among plays hosted there was Uqhawukakweqhina by 2011 Fleur du Cap best actor nominee Khayalethu Anthony, who was seen in the highly acclaimed Solomon and Marion at the Baxter. Other recent activities included an imbizo where artists from different communities around Cape Town were invited to participate in discussion around issues affecting theatre in their communities. Ngabanjani said they had signed a three-year lease with the Delft committee of community leaders who manage the leasing of the property, and pay R1200 a month for the use of the premises. Delft committee member Mandla Tyulu confirmed this but said some individuals had laid complaints with the City that the rent money was going into committee members’ pockets. But he said the money from the rent was used pay people taking care of the premises and he was shocked to learn the RAO was being kicked out. “Its bad and sad thing to kick those guys out. If the City wants to develop this place they must partner with those guys. They are doing a good job for the community,” said Tyulu. However, the City, who owns the land but is not responsible for leasing the building, says it is not evicting RAO but merely investigating whether they have authority to lease the rent office. Mayco member for finance, Ian Neilson, said the property management department was approached by the subcouncil and asked to investigate the fact that the building was being leased out by a committee calling themselves “Rent Office Management”, which is not authorised to lease out the property. Neilson said notices were served to the occupants on 4 October requesting they provide proof by 25 October that they have the right to occupy the property. The matter would be investigated with the organisation, he said. Meanwhile, Delft residents seem to support RAO. Community leader Buyisa Mjobo said gangsterism had destroyed the community and young people would “suffer” if the RAO was evicted. She regretted that the organisation was not established when she raised her three children.